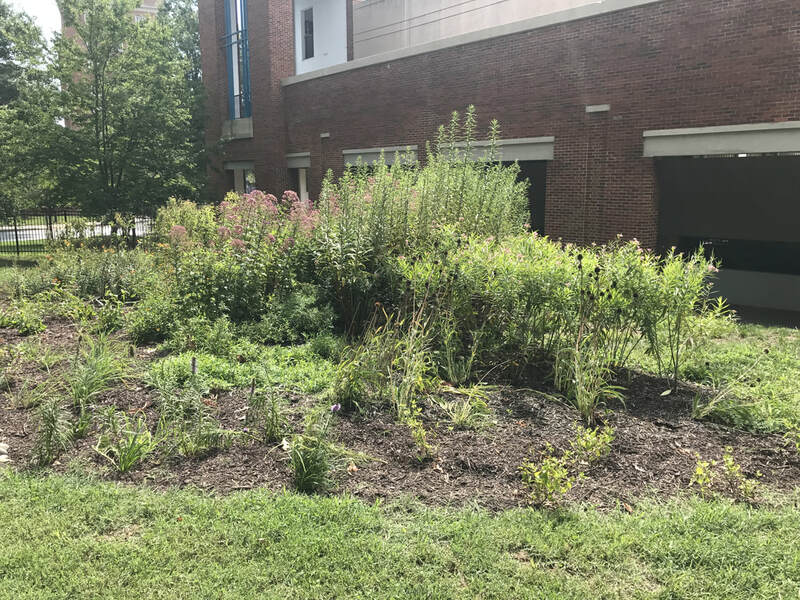 The "Adopt a Pollinator Garden" is an outreach and education program encouraging UMD departments and offices to plant and maintain pollinator-friendly gardens. The program is currently piloting a pollinator garden at the UMD Arboretum. The vanEnglesdorp Bee Lab adopted the Native Bee Wall and Garden (pictured below). Download our garden establishment guide and pollinator planting lists to create your own pollinator haven! Selecting a good site is crucial for the success of a pollinator garden. The site should be close to the people responsible for its maintenance for ease and accessibility. The site should be relatively visible both to pedestrians for public awareness and to those maintaining it for weed monitoring. It’s important to know the soil moisture and sun exposure of your chosen site. These two factors will help determine what plants will thrive in the area. Plant in the spring through the summer for best results and plant establishment rates. Clear the plot with shovels to loosen compacted soil and remove all weed root systems. Cut “X”s in the weed barrier appropriate for the size of the plant. Place plants in holes deeper than the plug to encourage root establishment and fill in gaps with loose soil. Create a clear delineation of the garden boundaries with landscaping stones or other boundaries. Immediately after planting, your new pollinator garden requires frequent watering to help the plants take root. Weeding regularly will help keep the pollinator garden healthy and ascetically pleasing. Enjoy the bees and butterflies your garden attracts! All of these plants are native to Maryland. For best results, plant gardens so that at least three nectar sources are in bloom throughout the grow season.